W hen September arrives, there’s an almost immediate change in the air, with a promise of warmer weather to come. Look around and suddenly along roadsides all over the country the acacia trees start blooming in shades of creamy yellow. The shepherd’s tree has its moment of floral glory as it puts on a beautiful show of fluffy green flowers. Inland during September a last cold snap might still be experienced, and unsuspecting gardeners might fall prey to a spot of late frost. Up in the Zambezi Region in the north-east, spring takes off a tad earlier, with the arboreal flower show starting in earnest in August. The first official day of Spring in Namibia is 1 September. Namibia enjoys Summer daylight saving and on the first Sunday in September, we set our clocks forward by one hour. This means that more daylight can be enjoyed in the afternoons, until the first Sunday in April when we change our clocks one hour back. Namibia is currently on GMT +2 hours, the time Caprivians retain throughout the year, as they prefer not to change their clocks with the rest of the country. The days are becoming longer, with 22 September marking the spring equinox. Derived from Latin, the word equinox means that the days and nights have more or less the same length around this date. Springtime presents the lowest risk for malaria, as the country is at its driest before the summer rains begin. That said, there is always a risk when you travel to the northern regions of Namibia – anywhere north of Etosha and especially in the vicinity of the rivers – so consider taking prophylaxis or avoiding these areas if you are pregnant or have children under five-years-old. Pollen drifting off the blooming acacia trees can cause respiratory allergies and hay fever; so don’t forget to pack the antihistamines. As spring moves towards summer, the weather can become oppressively hot and the risk of sunburn is huge. There is little cloud cover, especially in central and southern Namibia, so don’t forget to pack long-sleeved shirts, a hat and sunblock with a high protection factor. Dehydration can be a problem too as the days become hotter, so be sure to drink enough fluids. Spring is a good time to buy game-meat products, as the hunting season comes to an end at the end of August. Namibia has been experiencing drought for a few years now, so please do your bit to save water. For example, closing the tap while you brush your teeth could save as much as a whopping 11 litres of this precious resource! You can leave most of your winter-wear at home at this time of year, once spring sets in it rapidly becomes warmer. Pack a warm jacket for nights and game drives in open vehicles and summer-wear for the daytime. Remember to protect you skin against sunburn by wearing long-sleeved tops, ideally made from cotton. Take closed walking shoes along for wandering around the desert and over rocks. It is advisable to wear long pants and socks at night to guard against pesky mosquitoes. Spring is all about new beginnings, and what represents this better than flowers! The water-thorn, Acacia nebrownii (yellow flowers), is now at its flowering peak. In spring, thickets of this straggly shrub can be seen lining the roadsides in Etosha for most of the route from Okaukuejo to Namutoni. A. mellifera, with its cream-coloured blossoms. Up in the Zambezi Region, the knob-thorn, A. nigrescens, is now flowering with a profusion of long creamy inflorescences – a feast for birds and animals that can climb. Later in spring, the umbrella thorn, A. tortillis; mountain-thorn, A. hereroensis; and the sweet-thorn, A. karroo, enjoy their peak flowering seasons in November. With its distinctive yellow flower balls, the stately and ubiquitous camel-thorn, A. erioloba, can be seen in and around Windhoek. And lastly, the less common monkey-thorn, A. galpinii, found only along rivers in the Zambezi Region, is a popular choice for gardens in Windhoek, as it grows quite quickly and is flowering now. 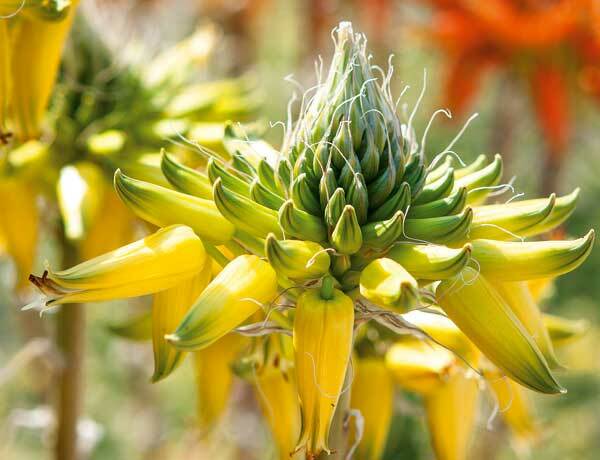 In southern Namibia, Aloe claviflora can be seen flowering in large groups on the Hobas-Seeheim road. It is often the only colour you’ll see in the desert at this time of year, and will now be sporting beautiful dense shows of orange blossoms. Aloe hereroensis, of which you can see orange and yellow specimens at the petrol pump at Okaukuejo in Etosha, flowers until September. The sickle bush, Dichrostachys cinerea, begins flowering in October all over Namibia. 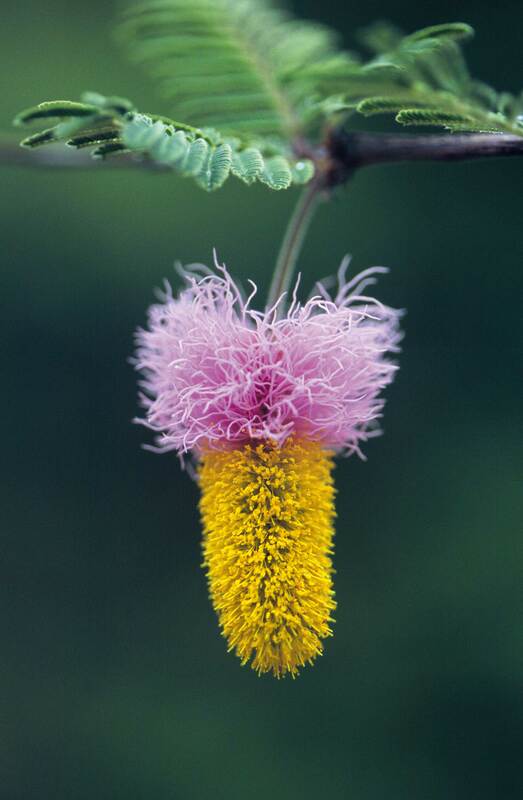 It bears a small, delicate hanging flower in pink and yellow. The trumpet thorn, Catophractes alexandri, is now starting to produce large, soft white flowers on bare branches. Flowering in spring in the north-east are sausage trees, Kigelia africana, (there’s a lovely specimen in Windhoek at the National Botanical Research Institute), and the attractive rain tree (Philenoptera violacea) in the Zambezi Region. In Windhoek you’ll see many examples of the common coral tree, Erythrina lysistemon, not indigenous to Namibia but colourful enough to brighten up the city. Our indigenous version, the Namib coral tree, Erythrina decora, also flowers in spring. You’ll see it less often, but there is a specimen at Dolomite Camp in western Etosha. If you thought winter was good for game viewing, you’re in for a pleasant surprise. In September and October it reaches its peak – until the first short rains fall in October. Tension mounts at the waterholes this time of the year, since the last good rains were around April and the animals need to drink every day. As it’s also a popular time for tourists to visit Etosha, the waterholes become quite crowded by humans too! Antelope such as springbok, black-faced impala and red hartebeest will be nearing the end of their gestation periods, usually giving birth at the onset of the rainy season. 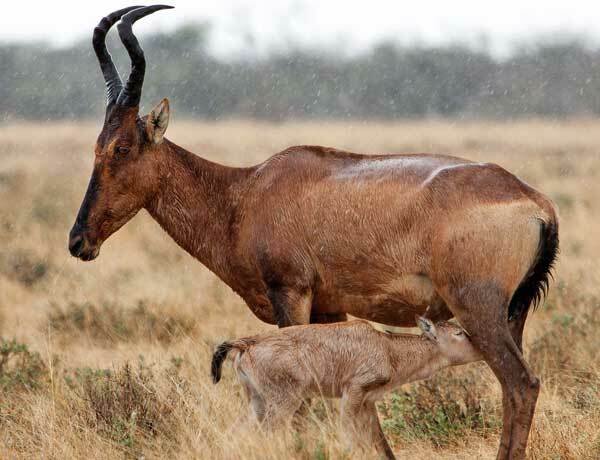 Red hartebeest carry their calves for about eight months, typically giving birth just before the summer rains begin. While driving along Namibia’s roads, you’re likely to see more animals, as by now the grass is all but gone, but be warned, the first rains bring out a flush of spring green along the verges, which attracts small antelope and warthogs and poses a risk to drivers. Well, you won’t have to look very far to hear the first sounds of spring-nesting birds, especially in Windhoek, as trees in gardens all over town are already sporting the first southern masked weaver nests. The sound of weavers becomes synonymous with spring when you hear the ‘swizzling’ calls the males make while competing for the females’ attention. This is done while hanging upside down from a nest, twirling from side to side and frantically flapping their wings. It’s a lovely sound that Namibians look forward to every year. These weavers particularly favour thorn trees and methodically pluck the leaves from the intended branch, presumably so that they can see predators approaching. The first few nests are often practice attempts, with the female discarding the offerings of the male until he has perfected the art. Even established males seem to forget the art of nest building during winter and have to practice a bit first. When the female has chosen, he rips the other nests apart and starts afresh, keen to attract more females, until a whole colony has been established. IN ETOSHA: The white-crested helmet shrike nests from September to December. These birds live in small flocks, and breed co-operatively, taking turns to incubate the eggs in a cup-shaped nest. A good place to see these little birds is in Halali Rest Camp. 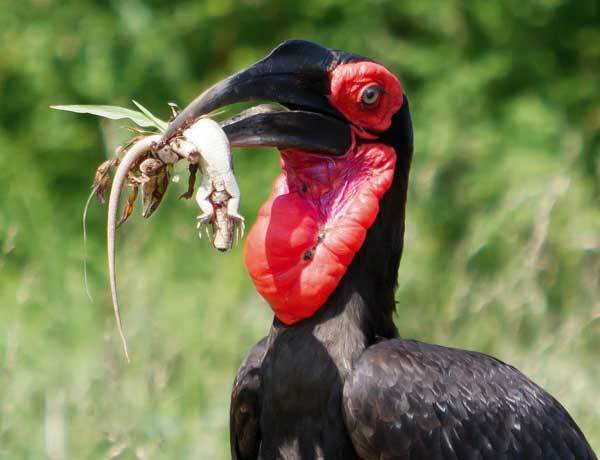 IN THE ZAMBEZI REGION: See if you can spot a southern ground-hornbill along the roadsides. The males will be foraging to feed the nesting females from October onward. 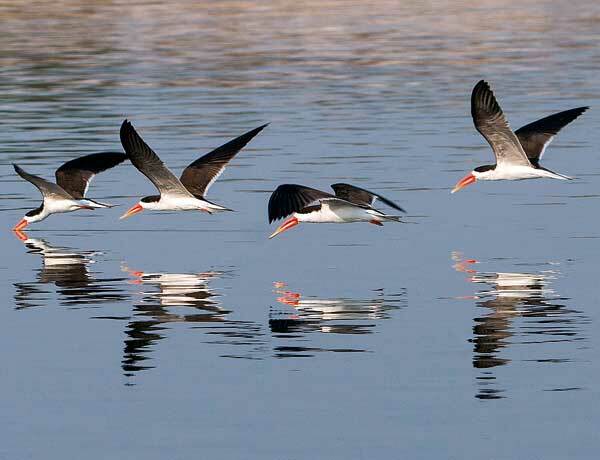 Now is also the time for African skimmers to arrive and start mating and nesting. They lay up to three eggs in a scraped-out hollow on the sandbanks in the middle of the big rivers up in the north-east. See them on the Zambezi, Okavango and Kwando rivers. You will also see large colonies of southern carmine bee-eaters nesting on the riverbanks in the north-east from September onwards – a spectacular sight indeed. By November the summer visitor birds start arriving to feed and breed in warmer climates. IN THE NAMIBIAN INTERIOR: Hornbills make their preparations to breed between October and February. These birds nest in holes in trees, which the females seal from inside. Crimson-breasted shrikes are also preparing for the breeding season, with October/November being their time. Southern red bishops don their colourful red/orange plumage now to start vying for mates. You’ll find them in wetland areas and Windhoek gardens. As the rains start earlier up north, the endangered blue cranes will start looking for nesting sites in Etosha from October onward. IN THE DESERT: Namibia’s famous endemic dune lark is a species that breeds all year round, and can be seen without difficulty at Elim Dune near Sossusvlei.